(Nanowerk News) CRAIC Technologies, the world leading innovator of microanalysis solutions, is proud to announce Spectral Surface Mapping™ (S2M™) capabilities for its UV-visible-NIR microspectrophotometers. S2M™ gives CRAIC microspectrometer users the ability to map the spectral responses across of surfaces of their samples point-by-point. With microscopic spatial resolution, surface profiles can be created using UV-visible-NIR transmission, absorbance, emission, fluorescence and polarization microspectral data. S2M™ can even create maps from Raman microspectral data from the CRAIC Apollo™ Raman microspectrometer. CRAIC microspectrometers can now created highly detailed spectral maps with micron scale resolution rapidly and automatically. Spectral Surface Mapping™ is a plug-in software module used with CRAIC Technologies Lambdafire™ microspectrometer software. When employed with CRAIC Technologies microspectrometers with programmable stages, S2M™ allows a user to automatically take spectral measurements with user-defined mapping patterns that reach to the movement limits of the stage itself. With the ability to measure up to a million points, high definition maps of the spectral response of the surface of a sample may be generated. And because of the flexibility and power of the software, the maps may be from transmission, absorbance, reflectance, fluorescence, emission and even polarization data. Raman spectral responses may even be collected and mapped when used with CRAIC Technologies Apollo™ Raman microspectrometers. S2M™ gives even more power to the scientist and engineer to study the entire surface of their samples by several different methods and in the highest level of detail. 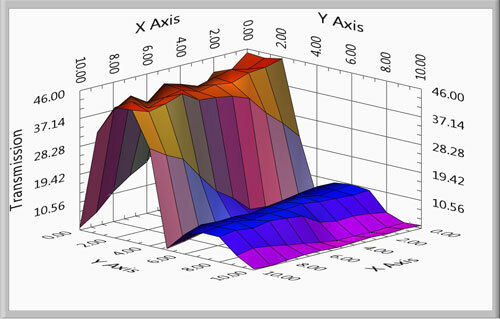 For more information about Spectral Surface Mapping™ capabilities of CRAIC Technologies microspectrometers, visit www.microspectra.com .